We have been working with our architect to finalise our plans for our self build. We are really happy with the plans but thought it would be interesting to share them here and benefit from the helpful critique, experience and suggestions others have obtained doing the same. 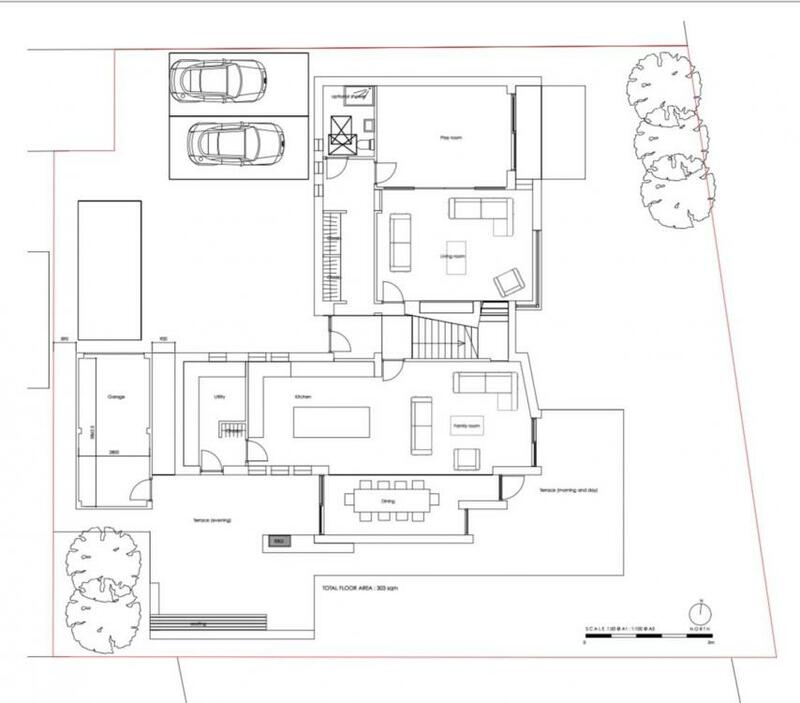 The house itself is on the larger side being 303sqm (exc garage) as it is to accommodate our growing young family. Do you really want an angled wall in Bed 3 and family area? A large house such as this would ideally have a double/triple garage. Is the plot too tight for this? I like the design. Windows with sloped or apexed head are tricky for blinds / curtains / shutters (not sure if this applies to you). I am not keen on the Jack and Jill bathroom. You have enough space for two en suites and could even make bed 2 500mm smaller if needed. Thanks for your feedback, we quite like the angled wall and corner windowx as design features but appreciate they might end up expensive features which may have to consider changing when we get quotes etc. Ill have ave a look at the double landing, hadn’t occurred to me it could be tight. Yes; plot is too tight for a bigger garage however we had decided fairly early on that since all we use our current double garage for is storage, it’s a sacrifice that works for us. Thanks for the heads up re windows and blinds. I’ll look into that a bit more. It's huge! what floor area are you working on there? Floor plan is quite interesting, there's a few wee bit's i'm not convinced by, but you've obviously worked on this for a while to get it where you want to be! Agreed. The bit to the right of the front door would make a four bed developer house. It’s 303sqm. 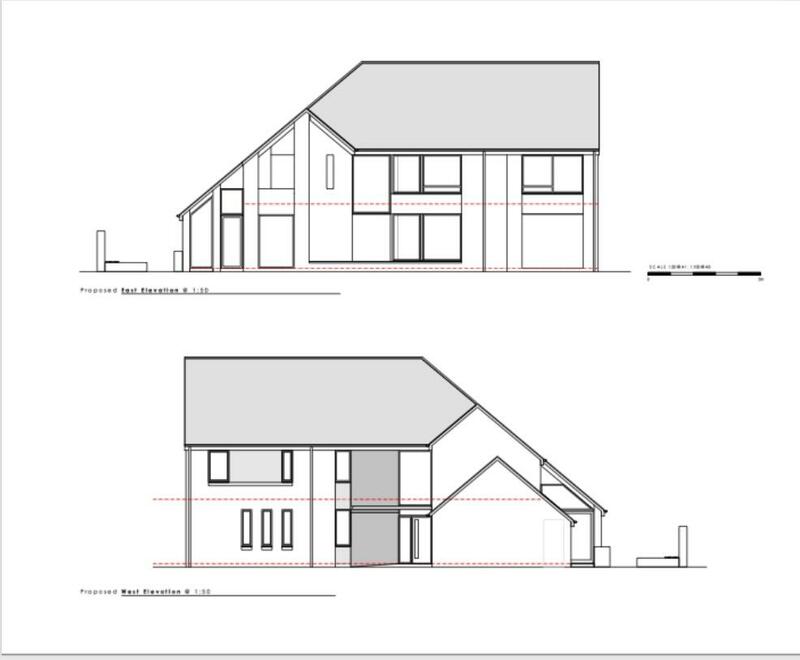 Originally the plan suggested by the architect was to keep the kitchen/utility to a single story but we decided to build up since we would be paying for foundations/roof etc anyway. I’d be keen to hear about those bits you aren’t convinced by, I’d like to see how our thoughts/decisions stack up against challenge. Yes, the architect mentioned this around the elevations and is working on a materials schedule now with this in mind. I've been chewing on this since yesterday, and I don't think I am convinced that you are getting as much for your floorspace and budget as I would expect. Whilst I agree with the previous comments that it is an attractive and pleasant house, I think that it is not yet a great or very flexible house. I think the outside is probably a more attractive design than the inside to me. But how to feed back without sounding hostile, and still be provocative but contructive? Rather than list details yet, let me start by asking you to think about "use cases". ISTM that for 300sqm and the best part of a million ukp including plot, you could reasonably expect everything you could ever want, and then some more. 1 - A parent has to come and live with you? 2 - One or both of you need to work from home? 3 - You have another child, and it turns out to be twins? For a large house like that, I think that all of those should be easily accommodated, and I am not sure they can be on the current design. Switching to rooms and spaces, as I see it you have 3 very generous beds with baths including a master suite, one more generous bed, family bath, a nice big kitchen-diner-sitting, and 2 more reception rooms set up as a playroom and a lounge. The "wow" features are the 'bridge' on entry and some interesting profiles / details on the roof and rear facade. For an extra 100 sqm and 200k on the build budget over a 350-400k 200sqm house, I think that more could be expected. The impression I get is that the extra space and cash budget has gone in part to the bridge and void (and even more space beyond the 303sqm has gone into the insets in the rear facade), but that most has gone to adding space to the same selection of rooms that I would find in a 20-25% smaller self-build house, rather than doing things a little differently to relfect the larger dwelling. I have all of the above or equivalents in my 2100 sqft house, and it feels generous so I am not sure that all that space needs to go towards making the rooms huge rather than merely very generous indeed. What would I change on the current design to go in the direction I suggest? 4 - As mentioned, the stairs do not seem resolved. That stub corridor to a bedroom door and window seems incongruous. Move the door, make the stairs full width with half landing, and put an even larger stair window and window seat on it to give another wow, which will also dramatise the route in for visitors. Put an interesting feature tree or bush at the back fence where it will be seen as people walk in. Make the stairs 35 degrees of slope or even less. 5 - Am I right that Bed 3 is entirely north-facing, and never actually gets any sunlight? I could have misread the plans. 6 - In a 35-40 sqm master suite, istm that it should be possible to find room for a relaxing-bath in addition to a conventional shower. I would also look at turning that Master Bed window into doors onto a balcony in the recess - inward or outward opening should fit. If neighbours overlook, then it could be angled south. 7 - I would make provision to easily divide up the Jack-and-Jill into 2 should it be needed. 8 - I would look to adjust the downstairs to give an easily adaptable grannex. 9 - I would try and create an extra room upstairs as Bed 5, for flexibility and a hobby room or office. 10 - I might try and create a study / reception 3 downstairs for similar reasons. And that is without getting into things like gyms and cinema rooms. 11 - I wonder if storage space is too slight, and you will end up with a large traditional shed. 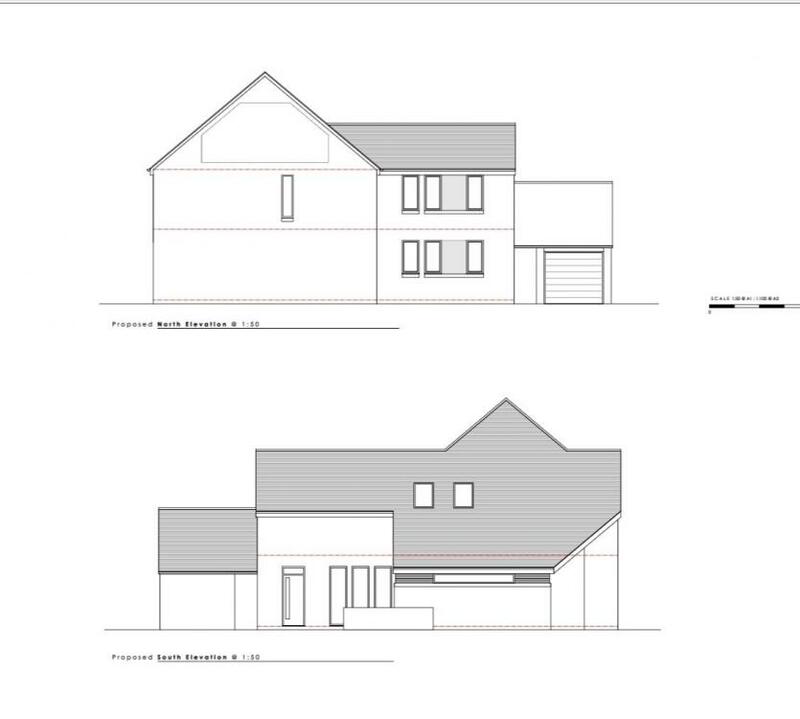 Personally I would want a double garage, or at least make some use of the gable void above the existing. I think that one feature of great designs for normal houses is how they organise space for ancillaries (eg garden store, workshop etc) into the original concept. 12 - I do not understand the passageway between the garage and house. Why is that space not inside the garage? How to approach it - I would perhaps suggest giving your architect some extra constraints if you want to pursue these lines, and see what emerges. Best regards. You did ask for alternative views ! It looks like an expensive one to build to me - lots of 'interesting' angles and change in elevations etc Bet that chews through £400K fairly quickly. The first thing I thought on looking at your plans was 'what a lot of wall and roof junctions'. These may well add to the percieved aesthetic, but they will make your build far more expensive and time-consuming and these sort of junctions are also inevitably weak points as far as insulation, cold bridging and air-tightness go. They are not very green and will cost you time and money. This may mean you have a fancier looking house from the outside, which will look good in your architect's portfolio, but it is you that has to pay for it and live with the compromised comfort and higher bills that they will bring. Unless there are a series of obstacles on your plot that you need to design around, I can't see the need for them. You can do beautiful things with an oblong house or a simple L shape if you must. Well, there's a few bits - but please try not to be offended! On the plan you have two sitting areas on the ground floor, these are both almost identical proportionally and they both look like they have the same height ceiling. The stair seems a bit like it's just flung in, like you've said you wanted a feature stair and you've got one, but you can't walk around it and it's not really open to any rooms. the corner window in that room too, looks like a bit of add on bling, it's a costly detail but you've only got a small return on it so what are you really looking at through it? then the off-square bit of wall in the other lounge? not sure what that is doing? The elevations don't really work for me, the roof form gives it an overall uncomfortable massing, there's not a lot of balance to it - it feels lopsided especially where you have eaves heights that could be touched from the ground (an arts and crafts touch maybe?) but that roof then goes supersized and over the top of the ridge to another even higher roof, the south elevation doesn't really seem to have much hierarchy in the design, I'm all for designing from the inside out but this one confuses me a bit! I'm not even sure that any of the gables have matching eaves heights! Would be interesting to see a site plan showing the neighbours and views etc because it's hard to figure the rational behind some of the elevation treatment. Thanks for taking the time to feedback, it is appreciated. To give you a little bit of context it’s more of a £500/550k house as opposed to £1M which maybe impact some of the overall comments. We had already considered a few of the comments/point raised and some are entirely new which is exactly the reason we thought it would be good to get feedback. 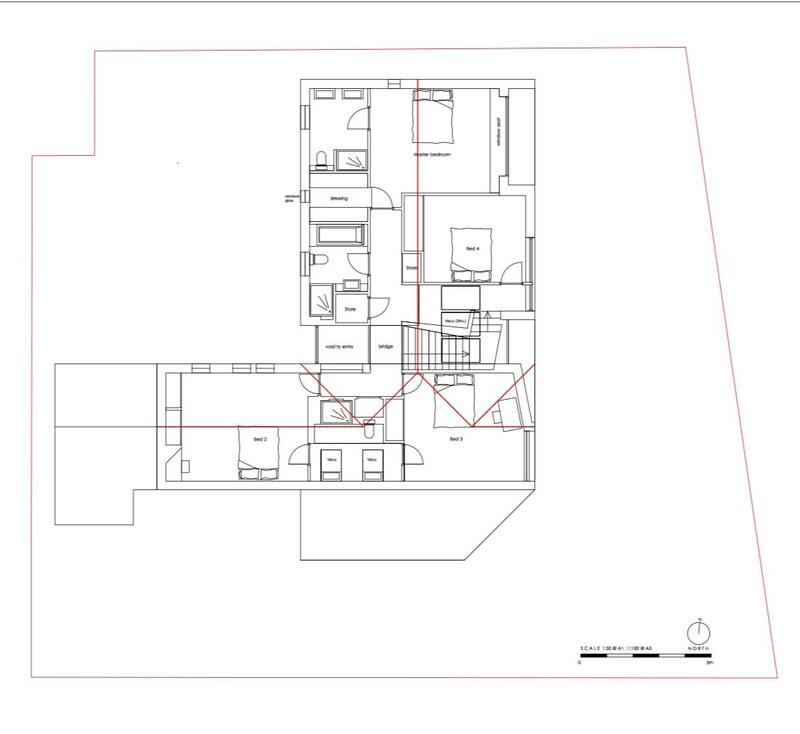 The space itself is fairly flexible and we feel that rooms could easily be changed around to reflect our needs further down the line eg playroom could become fifth bedroom/grannex since the bathroom is next door. We are also putting in roof trusses to be able to go up a level in the future so this could accomodate future studies/cinema rooms etc should we require the extra space (especially if we end up having twins 😂). We we have decided to square off the angle on the open plan living area as it seemed unnecessary so this might give us a bit more hidden storage and flexibility with the stairs. If that is the finished value you will need to be very careful that your total costs do not exceed this. There are lots of areas where savings could be made but I think you may need a bit of a redesign. There is currently a lot of wall, window, roof (and scaffold etc) in relation to floor area. My estimate was out of pocket cost - £1800 per sqm * 303 sqm = approx £550k plus a plot which would be the thick end of £150-180k maybe. Equals 750k or so, which could easily be the "best part of a million" once it has had fees and more fees and extras and higher specification and more charges for getting bits done quicker and budget-creep and contingency and necessary breaks away and supplementary kit and repairs to the supplementary kit and gold-plating :-). Nothing wrong with gold-plating of course if you do it at the end after you have paid for the rest. Good stuff - the detail of different views may throw up other things. Best of luck, and spend spare time on thinking first not regretting later in all aspects. * £1800 per sqm is reasonable for a complex-ish self-managed build. My plot price could be some way off as I am not that familiar with the Scottish sub-regions - except that Edinburgh seems to be expensive !